The 1998 British Grand Prix was the ninth round of the 1998 Formula One World Championship, it held significance as being the first race that has been won by a driver from the pit-lane. Michael Schumacher took the race win when he came in to serve a drive-through penalty on the final lap of the race for overtaking under safety car conditions. Championship leader Mika Häkkinen was second with Eddie Irvine in the second Ferrari, third. Heading into Britain, Mika Häkkinen maintained a six point advantage over Michael Schumacher. Häkkinen's teammate David Coulthard, who headed into his home race at Britain was a further 20 points down on Häkkinen. Before the race there was a week of testing held at Silverstone, McLaren held the advantage in these tests. The big surprise was the performance of the Jordan's who appeared to be very quick following a series of upgrades to their car during the tests. Stewart had also brought an upgraded Ford Zetec engine to the British Grand Prix in hope of moving them up the grid. Following the French Grand Prix rumours continued to link Jacques Villeneuve to the newly formed BAR team for 1999 which was being run by his former manager and friend Craig Pollock. To further enforce this theory, CART champion and former F1 racer Alessandro Zanardi was being linked as a replacement for Villeneuve in Williams. During the Friday practice sessions, it was David Coulthard who ran fastest throughout the day. Coulthard maintained his pace throughout the day ahead of teammate Häkkinen. Coulthard would however recieve a £8 000 fine for speeding in the pit-lane. Michael Schumacher was quiet throughout the day, focussing on set-ups doing only single flying laps before returning to the pits. He was seventh fastest at the end of the day. The Williams cars were running well with Heinz-Harald Frentzen and Jacques Villeneuve third and fourth on the grid. Eddie Irvine was fifth fastest despite a spin into the gravel trap during the morning session. Before the qualifying session began, it was announced Ralf Schumacher would lose his fastest time during qualifying for failing to slow down during a yellow flag period following Giancarlo Fisichella's accident in the Saturday practice session. The session started with the two Tyrrell cars and Esteban Tuero's Minardi going onto track almost immediately. They were then followed by Johnny Herbert's Sauber. It was Jacques Villeneuve to set the first competitive lap time amongst the front runners taking the provisional pole time. Michael Schumacher's Ferrari was not impressive on his first run, although he took the fastest time he was almost immediately bettered by Heinz-Harald Frentzen's Williams car. However on his second run, he was much more competitive going a full second faster than Frentzen's time. Schumacher's time did not last long at the top as Mika Häkkinen then took the provisional pole time. Eddie Irvine then came round to set the third fastest time, right behind teammate Schumacher. David Coulthard managed to set only the third fastest time following his first lap time. More bad news occured for Ralf Schumacher when he spun his car on his second flying lap and stalled the car, forcing him to jog back to the pits for the spare car. Häkkinen then came round to improve his pole position time despite making a mistake during his lap. Frentzen then did well to improve his time to go third fastest in the session. Schumacher managed to close the gap to Häkkinen but still was not able to overtake the Finn who was dominating the session. Coulthard was still struggling to compete with Häkkinen and Schumacher ahead of him, one of his flying laps being held up by Eddie Irvine's Ferrari. Irvine who was lingering in a disappointing seventh managed to improve his time to go fourth fastest. However Villeneuve was able to put in a searing lap to bring his Williams up to third. Häkkinen came close to bettering his best time but messed up the final sector of the circuit. Schumacher and Coulthard tried to better their times but it was to no avail. The session ended with Häkkinen taking pole ahead of Schumacher, Villeneuve, Coulthard, Irvine and Frentzen. Following the session, Ralf Schumacher and Olivier Panis had their times to deleted meaning they would start from the back of the grid. The pair were disqualified the session for failing to exit their car in the neccessary time period following the pair stopping their cars out on track. Rain had afflicted the track throughout the day, although the rain had subsided before the start got underway, the track remained quite damp. Mika Häkkinen kept his lead into the first corner, with Michael Schumacher in tow. Jacques Villeneuve made a poor getaway dropping behind David Coulthard and Jean Alesi who had made a phenomenal start from eighth on the grid to climb to fourth. Eddie Irvine made an appaling start dropping down to tenth position. On the second lap Irvine managed to reclaim ninth from Alexander Wurz. Lap three saw Irvine reclaim eighth from Johnny Herbert as the order at the front stabilised. Ralf Schumacher had made a strong start climbing up to thirteenth by lap four. The same lap the older Schumacher made a mistake whilst chasing Häkkinen for the lead of the race meaning he fell right back into the clutches of the second McLaren of Coulthard. The following lap Coulthard managed to make his overtake on Schumacher's Ferrari for second position. On lap five the rain returned providing further challenges for the drivers. At the front Häkkinen then began to establish a lead as Coulthard began to pull away from Schumacher in second. Irvine further advanced his recovery drive on lap 7 by overtaking the Jordan of Damon Hill around the outside of stowe. The following lap Jacques Villeneuve went wide losing two places to teammate Heinz-Harald Frentzen and Eddie Irvine. Michael Schumacher then began to find some pace setting the fastest lap on lap 9 as he set out to catch the McLaren's. Ralf Schumacher, meanwhile had began to apply heavy pressure to Giancarlo Fisichella's Benetton who was running in eleventh place. Lap eleven saw Irvine take fifth place from Frentzen's Williams. The other Ferrari of Michael Schumacher then set the fastest lap of the race the following lap with a 1:35.704. Ralf Schumacher then pitted on the following lap for a new set of intermediate tyres. The two Stewart's meanwhile fitted dry tyres, a critical error as the two cars struggled around the track. Lap 15 saw the first retirement when Damon Hill spun at Brooklands corner and stalled the engine. Hill angrily beat the steering wheel as he retired from his home grand prix. Two laps later Frentzen also spun off the circuit in the wet conditions ending his race as well. The Stewarts meanwhile realising their error returned to the pits for intermediates. The rain had began to intensify yet despite this Michael Schumacher came into the pits for a new set of intermediate tyres on lap 19. The following lap saw Villeneuve and Wurz pit also fitting intermediates. A couple of laps later Coulthard then came into the pits for new intermediates. Two laps after Coulthard, Alesi and Irvine came into the pits. Alesi however made a poor pit-stop and Irvine was able to gain fourth position from the Sauber despite being several seconds behind Alesi as he entered the pits. One lap later Häkkinen came into the pits for wet tyres, becoming the first driver to come in for the full wet compound. Irvine was then able to take fourth position from Johnny Herbert on-track. Herbert was the only driver of the front-runners who had yet to make a stop. Ralf Schumacher had managed to climb up to seventh position following the pit-stop phase. Lap 27 saw two retirements, first being Mika Salo with throttle failure then Johnny Herbert who was struggling on old tyres spinning into the gravel and being bogged down. Herbert managed to get a push-start by the marshalls to get him out of the gravel but immediately retired from the race due to the illegality of a push-start. Two laps later there was more victims in the rain with the backmarkers of Esteban Tuero and Ricardo Rosset spinning into the gravel. As the track became increasingly wet, Häkkinen on wet tyres was able to extend his advantage over teammate Coulthard. However when Häkkinen caught up to traffic, Coulthard then began to catch the leading McLaren beginning to apply the pressure on teammate Häkkinen. However soon enough Coulthard caught the same traffic and as he attempted to weave his way through the backmarkers he made a critical error in getting caught out on some standing water where he spun violently into the gravel trap and out of the race. Shortly afterwards Irvine came into the pits for a set of full wet tyres. 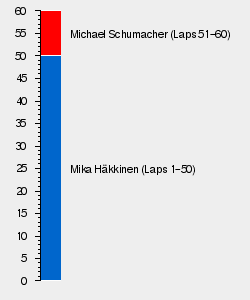 The following lap Häkkinen and Schumacher made their pit-stops, both fitting the full wet tyre. Jarno Trulli then spun his car into retirement whilst the same lap Jos Verstappen suffered an engine failure, spinning his car as he pulled off the circuit. As the race intensified those that were on the intermediate were forced to come in for full wets. Race leader Häkkinen then spun his car entering bridge corner but luckily for him he was able to continue without losing his lead. Rubens Barrichello was the next retirement when he spun into the barriers. Barrichello was followed by Olivier Panis into retirement with the Prost driver spinning into the gravel trap. Shinji Nakano also had a moment off track but luckily for him was able to continue driving. With the conditions continuing to worsen, the safety car was brought out on lap 41. With the safety car coming out, Häkkinen's 40 second lead was wiped out as the cars bunched up behind the safety car. At the end of lap 49, the safety car came into the pits and the race resumed. Within a lap of the safety car entering the pits Pedro Diniz spun out of the race. Esteban Tuero then spun but resumed the race. Schumacher, meanwhile began to apply pressure to race leader Häkkinen. Under the pressure Häkkinen ran wide and onto the grass allowing Schumacher to take the lead from the McLaren driver. Schumacher immediately began to pull away from Häkkinen at a vast rate opening up a comfortable lead in the race. There was disappointment for Alesi, whilst running in a competitive fourth Alesi pulled off the circuit and into retirement with electrical failure. Ralf Schumacher who was running in sixth began a great battle with the Benetton of Alexander Wurz, coming close several times to overtaking in attempt to gain Jordan's first points of the season. Häkkinen began to struggle with Irvine coming up behind him and beginning to threaten his second position. There was drama in the final laps, Schumacher was given a stop and go penalty by the stewards for overtaking Wurz under yellow flag conditions. Schumacher would not serve his penalty until the final lap of the race. Coming into the pits Schumacher crossed the line before pulling into his pit box to serve his penalty. This technality meant that Schumacher would take the race win ahead of Häkkinen, Irvine, the two Benetton's of Fisichella and Wurz and Ralf Schumacher, who gained Jordan's first points of the season.